Katie Voeltz is an accountant and busy mom living with her husband, Mike, and three children in northwest Sioux Falls. And while her zip code is a city, her heart and history have always been in the country. “Going back to the farm is all about our roots and time together as a family,” says Voeltz, whose husband also comes from multiple generations of farmers. Over 2,500 South Dakota farms have been in the same family for more than 100 years. She and her family return to theirs in Bridgewater once a month. Voeltz’s 7-year-old son Evan’s first item of business is to take the golden retriever, Cash, for a walk and run around the open space. Her daughter Bridget loves to bake with grandma and take walks with her around the farm. And her youngest, Hannah, just had her first Gator ride. 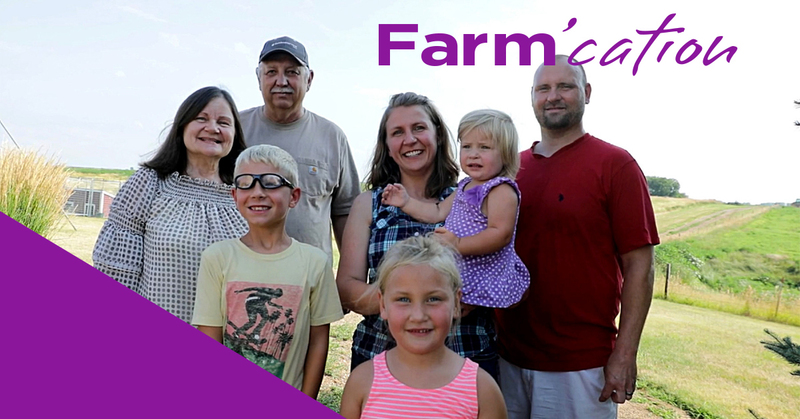 This summer farm’cation keeps the family connected to their roots and serves as a great getaway before school starts up. And while it’s a relaxing time together away from the bustle of the city, Voeltz knows it’s so much more than that. Ninety-eight percent of South Dakota farms are family owned, and the fruits of their labor really do add up. According to the South Dakota Department of Agriculture, South Dakota ranks #1 in oats and sunflower production, #2 in hay and alfalfa, #3 in spring wheat and #5 in beef cattle. This impressive production is only possible through the survival of the family farm from one generation to the next. The average farmer feeds 155 people here and abroad. But it’s not just about the numbers, it’s about engaging youth to bring their skills, enthusiasm and experience back to the land of their family. Voeltz and her siblings’ families come home each year to help with the harvest where her parents Ronald and Carla Stahl farm 1,400 acres of corn and soybeans. Young Evan knows where he came from. And now he also knows how to help grandpa underneath the planter. Truly a farm’cation.